Mohs surgery is state-of-the-art treatment for skin cancer in which the physician serves as surgeon, pathologist and reconstructive surgeon. The procedure is performed in our office by Dr. Mark R. Pomaranski. 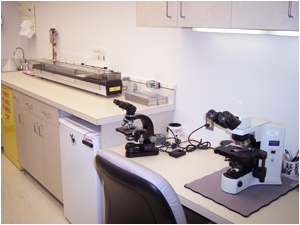 The Mohs team includes Dr. Pomaranski, his nurses, and a histotechnician. It is an outpatient procedure that involves removing the visible tumor and then creating a map of the cancer site. Layers of tissue are removed in a very controlled and precise manner to eradicate the skin cancer. Each layer is examined immediately under a microscope. When the layers are shown to be cancer free, the surgery is complete. The surgery typically starts in the morning and completed the same day. Mohs surgery saves more healthy tissue than other procedures and is highly effective because the process traces the skin cancer to its roots. Clinical studies conducted at various national and and international institutions demonstrate that Mohs surgery provides five-year cure rates exceeding 99% for new cancers, and 95% for recurrent cancers. 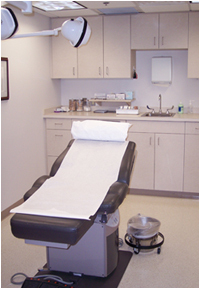 To learn more about Mohs surgery, please visit the American College of Mohs Surgery website. You will find a wide range of resources, including an educational video. Appointments can be made by contacting our office. A preoperative consultation is necessary to assess, coordinate, plan, and prepare the patient appropriately for surgery. Please understand that, although every effort will be made to minimize travel, Mohs surgery is not usually performed on the consult day. If you have questions or any concerns regarding Mohs surgery, we encourage you to contact our office.